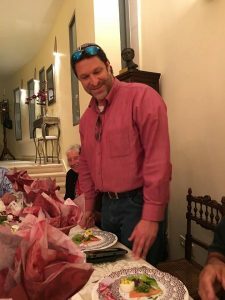 This is a goodbye letter written by Jane Kiel to her friend, Ari Fuld! Tonight you made it into all the big news casts and your face is all over the media. You are being called a hero and a lion by everyone and that’s truly what you were. But you didn’t make it into the media because they finally realized that you were absolutely incredible, extraordinary and the biggest advocate for Israel that was always standing for truth, facts and history. You are making headlines because you were brutally murdered and all of Israel is in shock and completely devastated. You gave your life for the nation you loved so much. You came into my life and quickly became a very dear friend, someone I could count on in helping me become better and a bigger voice for Israel. You gave a nice speech at my birthday party “thanking God for creating Jane and sending her to Israel standing in the gap for your people.”. You also shared the testimony of you being wounded in battle for Israel, a true miracle story that touched the entire party! We made several live broadcasts together in sharing raw truth about Israel from Israel. We laughed together, and we were furious and devastated when we had to report about a new terror attack. Our hearts were broken again and again. When news broke about this terror attack, I automatically went on your page to get the latest update as you always keep us updated, but there was nothing there. I then watched the video of the terror attack as it reached the media, and then the news broke with your name, and I realized I was watching you being murdered, and I just started screaming! It hurts to even breathe as the sorrow is so deep! I received a text from you less than 30 min before the attack checking on me as I am down sick today, and now you are the next Jewish name on the long list of terror victims. Just a few weeks ago someone broke your phone, your only work tool that you used to make all your live videos while you were out and about reporting. Yes this was frustrating for you, but you were not angry at the person that did this, that’s the kind of guy you were. In these last days you were trying to set up a speaking tour in America, and I was saying people should be lining up to hire you as you simply were the best in standing for Israel, but things were going slow and I know you worked very hard. People and Facebook tried to shut down your voice, you were deeply frustrated about that, but you continued the fight to have a platform for your messages, and you were about to launch a brand new webpage that you let me have a peak on! It was amazing! Today your life was ripped away in the very same way that you were speaking out against every day. You were murdered just for being Jewish. You wrote articles and blogs about this, you went on tv debating people about this, and you always put them to shame as your knowledge was incredible and you presented the facts. You were the one I asked for advice, and the one that helped and encouraged me when I had threats coming against me. You were so humble and full of integrity, you were bold and brave and you sent me a video at 2 am just coming home from a terror related incident in your community to warn me, and you told me to be extremely careful regarding the threats I had gotten. You knew this was not a game but as serious as it can get for us being in the frontline for Israel, and today that became reality for you..
You spoke bravely about the Jewish Homeland and your right to this land, you completely debunked the Palestinian narrative and the lies and propaganda about Israel by simply stating facts. You were both sad and also angry about the status quo on the Temple Mount, something you openly spoke out against. We all shared your videos and blogs on all our social media because they were outstanding. You knowledge about Israel, the Torah and history was incredible. You were the best and that is why you should have been in all the news today, and not because your life ended in a terror attack! You were an amazing man, husband, dad, defender of Israel, warrior, friend, gentleman and a devoted Torah teacher, people loved your teaching every Friday, often they happened while you were managing the grill with big steaks for Shabbat dinner! I often told you, it was incredible how many people watched your live videos, especially every Thursday when you live streamed from the Kotel! The Holy Land lost its biggest star and fighter today. I’m beyond heart broken, and for the rest of the world unfortunately you will just be another terror victim on a long list…..
For me, I lost one of my best friends and Israel lost one of its finest. Who am I gonna get advice from now? Ari, you died in the land you loved so much. You died as the hero you were as you chased this terrorist even after you were wounded so you could warn others, and you paid the ultimate price. You were our inspiration as you fought evil against the Jews, you impacted tens of thousands of people around the world, you were a gigant! You always said, “the days are over when the Jewish people are victims, we are home in our godgiven homeland and we will fight for what is ours” Some people called you extreme, but you merely just stated the facts, and we all love you for it. You barely slept because there was so much to do. You were always active in your advocacy, and a true gentleman that went out of his way to help others. You worked harder for the IDF than anyone that I know. You went into war for Israel and lost some of your best friends. You had deep wounds from that, and could not attend funerals for terror victims as it simply hurt you too much! Ari Fuld WAS the biggest and best in standing for the Holy Land, the land that God calls His own. No one worked harder than you, all your time was spent on defending Israel. There will never be another like you. I honor you and your life. You will never be forgotten. To Benjamin Netanyahu and the Israeli Government; Today you lost the best voice your nation had, you lost the most valued, loved and appreciated man in Israel that people all over the world loved dearly. Thousands of people came to love and support Israel because of Aris amazing videos. People came to visit Israel because of Ari! Today a Jewish wife and 4 precious children have to say goodbye to their most beloved. A mother and father have to bury their son, and siblings their brother! All of our hearts and prayers are with them in this devastating time! Today the biggest light in Israel was killed by darkness, an evil darkness that keeps coming against the Jewish people, we need to WAKE UP and speak against it like Ari did. May your memory be a blessing, Your work will live on, we will continue to share it for the world to know! You are being honored by all the politicians, the President, the US ambassador and the Prime Minister, and also by VIPs in America.I really wish they would have known you and how you defended your land. The story of your brutal murder is news around the world. Tonight you got a heros funeral that you deserved, thousand and thousands of people wanted to honor you as you gave everything for your nation, IDF soldiers came in from all over Israel to pay their respect to you as you worked so hard for them. Rest In Peace my dear friend, a lion for Israel dying defending other people, dying while he as a true warrior fought yet another terrorist murdering a Jew!